Sometimes songs just speak to you, whether that be the music, lyrics or the voice, something just hugs you. Ryan Kinder’s version of Creedence Clearwater Revival’s Fortunate Son did exactly that for me, it spoke, hugged and grabbed me all within the first few notes. I would say that musically, my happiest memories were of the 90’s artists in the grunge, Seattle scene and beyond. Something about this particular version instantly made me think of Silverchair and also a bit later on Ray LaMontagne and Live. 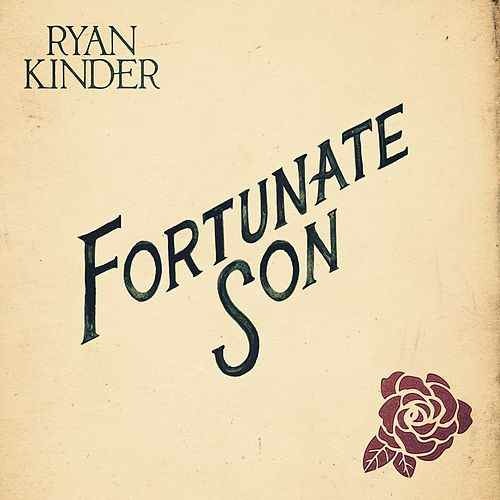 I have had Ryan Kinder on my radar for a couple of years now and have been eagerly awaiting a taste of new music and I am so glad to have this version of the song in my life right now. It is only January but a lot of new music has already been released this year already but I have to say that for me, this is one of the strongest releases yet. It isn’t pop infused, it isn’t up beat, or particularly catchy but it is simply just dang good music and I am so glad Ryan didn’t deliver this version in a heavily produced way. This stripped back, softened, slowed down version is really quite something and Ryan has certainly made it his own. Ryan’s vision of Fortunate son is something that I don’t think CCR fans will be disappointed with. Ryan’s vocals on this track are incredibly infectious with great control and impressive riffs. The melody is just so beautiful and wonderfully mesmerising and combined with his vocals, gives the version a very “Wow-factor” edge. Ryan filmed a black and white video for the cover song during YouTube’s Nashville Sessions which is available now and featured below. “I’m fortunate that I have a job that allows me to travel around our country and to meet people from all walks of life. Through those journeys, I have heard stories big and small, hopeful and heartbreaking, funny and frightening. The people behind these stories represent all corners of our country – Manhattan power-players, line workers from Detroit, farmers in Kentucky and teachers from Virginia. Though their backgrounds are diverse, there is a universal theme: we all have a desire to see our communities come together and prosper. Hate, divisiveness and discrimination is the outlier and should not be the norm. I’m not a political man, but I know everyone, in their own way, shares a common life objective to provide a safe place for themselves and their families, and to have pride in our homes. ‘Fortunate Son’ was written in a time of unrest in our country. John Fogerty’s observation on the landscape of his country gave voice to a class needing to be heard. A protest for their beliefs. As I recorded this song almost 50 years later, I would be remiss to not find similarities in our times. My protest does not lay on party lines but on a desire to see…again an age of decency, compromise and compassion. We deserve that. More info on Ryan here visit http://www.RyanKinder.com/tour.